What I was going to write about is this is a great time to do some prep work for your mallard hen houses and wood duck houses. But with this very mild winter and seemingly early spring, it will make it difficult if your nesting structures are in the ice, or water as the case may well be at this point. However, it's not too late to do this, you just may need to use a boat to access those structures that are over water. Certainly the wood duck houses that are over land you should have time to clean out and maintain them. I did observe my first wood duck sighting this past weekend in a near by pond. So as it looks, the weather in the coming week or so will be much cooler, or seasonal, it certainly won't be long before the ducks show up in mass. We would encourage you to (if you haven't yet) to get out soon and clean and repair if needed, your nesting structures. We would obviously recommend that you use a predator guard on a pole to mount your wood duck houses, as that give the hens the best chance to reproduce! We would also recommend that when cleaning your wood duck houses, that you count the white membranes inside the houses, as that will tell you how many ducks were hatched. If you are looking to purchase wood duck houses or predator guards, just call the MWA State Office, as we have them in stock for the spring! Best of luck with your duck nesting efforts! It does make a difference. Duck hunting has experienced a significant increase in popularity over the last several years with its journey into pop culture (looking at you, Duck Dynasty). 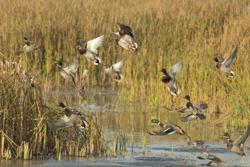 We are big fans of waterfowl, so we know how exciting the beginning of duck season can be. If you are new to the sport, there are a few tips you should take into consideration before heading out to take down some waterfowl. Before you can ever hit the water, you have to be legal. Be sure you get your hunting license prior to the beginning of the season. Also, if you are hunting on private property, get permission from the land owners. While there are plenty of public areas you can hunt duck, most landowners won’t mind allowing you on their property if you ask for consent first. Duck hunting calls for specific gear. You need quality camouflage that suits the environment in which you will be hunting. If you are hunting a dead grass area without a layout blind, a lighter, grassy camouflage will work. On the other hand, if you are hunting in a wooded area, a darker leafy or bark-like camo would be better. Since ducks are waterfowl, you’ll definitely need some waders and quality waterproof boots. Choose the waders that have the right amount of insulation for your area’s temperature, although you can always layer clothing under a lighter pair if necessary. The best way to learn duck hunting is through an experienced hunter. Find a friend, relative or neighbor who hunts legally and responsibly, and get out on the water with them. They will show you the ropes and make the whole process easier and more fun. Here we go. The fun part begins. Before you gear up and gun up, you need to do a little legwork. Scout the area. Drive by waterways and fields to see where the ducks are feeding. You don’t want to hunt the areas that ducks sleep, or you will disturb their roost. Once you find a good area, set up your blind or find a good area to hide. Most duck hunters, and bird hunters for that matter, use a 12-gauge shotgun. This is a good place to start for beginners. We recommend a semi-automatic shotgun, but a pump action can get the job done while adding to the challenge. Remember to buy non-toxic shots (this is the law), and that the size of your shot should match the size of your bird. Duck calling is a skill that takes time and practice to perfect. Your call could bring in the ducks or drive them away. So before you climb into your blind, be sure you practice your call. You could practice with an experienced friend, watch online tutorial videos or even take a class (yep, they have those). Now that you have your tips, you are ready to take down some waterfowl. Just don’t forget to grab the right type of camo. Check out trusted retailers, like Carhartt, for your camo and boot needs. Happy New Year - MWA is now 50 Years Old! Just wanted to wish everyone a very happy new year! We hope that everyone had a wonderful 2016 and we are very excited for the upcoming 2017. The MWA was started in Albert Lea in 1967, which means that the MWA has crossed a monumental threshold, we are now a 50 year old conservation organization. This is a remarkable accomplishment and we would like to thank each and every member and donor that helped to make this possible. You can also find this on our webpage by clicking the "Habitat" button. We are also working on the annual Waterfowl Symposium and Awards Banquet that is happening on Saturday February 4th, and the MPLS Airport Marriott. The Symposium is free to attend and starts at 9:00 a.m. and the Awards Banquet starts at 5:00 p.m. For ticket info for the Awards please call Luci at the MWA office 952-767-0320. Woodie Camp registration is open as of January 1st, and will remain open until mid May. The dates for Woodie Camp are August 6th - 12, 2017. This is for kids ages 13-17. We also have our Annual Winter Membership/Delegate Meeting scheduled for Saturday January 14, 2017 starting at 9:00a.m. at the MWA State Office. All members are invited and must RSVP to the State Office, again if you would like to come, please call Luci at the Office 952-767-0320. We have a lot of things going on this coming year and we hope you will be apart of it! Thank you for your support and once again, Happy New Year! Post Season Report - Happy Holidays! As the duck season came to an end it was like mother nature flipped a switch and brought on winter, and just like that the temperatures dropped and the winds began to blow. While many hunters were hoping for a more gradual transition from a warm fall to ice on the water, the cold front that ultimately jump-started the waterfowl migration, came a hair too late. As you probably noticed from the blog earlier in the season, hunters in some parts of the state started the season with some success, finding pockets of waterfowl across Minnesota. But as the season went on and the early migrators worked south, there seemed to be less and less ducks in the Midwest by the week. Wood Ducks were seen across the state into the middle of November, but the birds from north of the border were never pushed to make a large scale migration and fill in for the local birds who had already seen decoy spreads all fall. The lack of weather and pressure for birds to be on the move left waterfowlers with much to be desired by the end of the 2016 season. Many have described it as one of the oddest hunting seasons in their lifetime. But even in slow years, we are reminded why we love the sport and the outdoors. Many people reconnected with hunting partners from the past and swapped stories over coffee next to a marsh. Some hunters got to watch a new pup make their first retrieve while others cherished what might be the last hunting season for their favorite four-legged companion. The East Metro Chapter of the MWA helped a first time hunter shoot her first goose this season, while the Otter Country Chapter in Fergus Falls (the MWA's newest chapter) spent hours together in a blind enjoying the comradery of waterfowling, even on mornings when there were no ducks to be found. Each season that we are able to make it to our favorite marsh or field is one to celebrate, even if the numbers of birds bagged wasn't a record year. The great heritage of waterfowling brings people together to enjoy the outdoors year round, but especially in the fall. We at the MWA hope that you were able to appreciate the little things waterfowl hunting may have provided you this season, and we look forward to the year to come chasing birds or just enjoying the outdoors. Happy Holidays to you and the ones you cherish most! Weather has not been the friend of waterfowlers statewide during the 2016 season. Many of the hunters we have spoken with have reported slow seasons and low bag numbers across the state. There have been a few reports of nice mixed bags in central and west central Minnesota. According to the Weekly Waterfowl Migration Report sent out by MN DNR Waterfowl Staff Specialist Steve Cordts there are still good numbers of birds, both ducks and geese, in Canada but these birds are unlikely to start their move south in any large numbers until temperatures begin to drop. He did state that there has been a slight increase in Canada goose numbers over the past week as well as reports of some snow geese. Good numbers of ring-necked ducks are present in parts of the state as well, but according to Cordts many times these birds are being found on refuges. He also mentioned that a few late season migrants like scaup and canvasbacks have begun to show up in parts of the state, but not in great numbers. 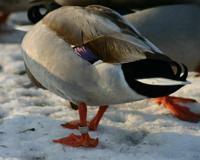 With water level's remaining high throughout the state, ducks and geese have their pick of hiding locations without much distance to travel to find food. The reports from hunters who have spent time in the Dakota's are similar to those here. There has been spot success for those who are willing to work hard to get to a hidden spot or out in significant scouting time, but overall it has been a very mild season for both bag numbers and weather alike. Here in the metro there were white-front's spotted a long way up and heading south earlier in the week. There were still wood ducks being heard from the deer stand in central Minnesota over the scorcher that was deer opening weekend. There is still time to get out to your favorite march or field to do some waterfowl hunting and at the very least swap stories or create new memories with your favorite hunting companions. Have a safe weekend whether you are chasing birds or pursuing deer. Don't forget to share stories and pictures of your waterfowl adventures to the MWA Facebook page! We are gearing up for the Minnesota Waterfowl Opener just a few days away. What as exciting time of year! The weather is just starting to change, the mornings are cooling off and the trees are starting to change colors. For us Waterfowl hunters the anticipation is coming to a boiling point. As waterfowler hunters the excitement is in full force, checking our decoy lines, making sure the duck boat can still float, maybe doing some last minute painting of the decoys or boat.. Checking the shotguns and making sure we have enough ammo and of course making sure we have the proper licenses etc. This time of year we are making plans to head out to our hunting spots and hoping that there are ducks using "our" wetland. One thing I have noticed it because of all the rains this late summer/early fall, there is water all over the place. Which means the ducks seem to be spread out all over the place. I am thinking that I hope there will be a lot of people out hunting this weekend to move some birds around otherwise I'm worried that the ducks will find a hideout and not come into my decoys. When I get home I need to recheck my blind for my boat to make sure it doesn't blow off when I leave my house, now that I think of it I need to check my trailer and see if those lights are working again. If you are reading this and are anything like me, all these things run thru your mind and about a million other things just gearing up for the duck opener. The good news is, the opener is just a few days away and I already know I won't get much sleep as I'm so excited to get out duck hunting in the coming days. I will be hunting with my 16 year old son this weekend once again and he seems to be as excited as I am. That makes me feel somewhat satisfied that I am passing on my love for duck hunting to my son. I hope you can bring someone out this weekend or this year and feel the same way. I look forward to introducing more people to duck hunting during the season. As for the duck season that is almost here, the reports are encouraging in Minnesota. Because of all of the rain, the wetland conditions are in pretty good shape across the state, and the breeding ducks have been good the past several years. I have witnessed good numbers of mallards and wood ducks in my travels, but haven't seen a lot of Bluewinged teal recently, but have heard several reports of good numbers of Ringnecks and Redheads in the west central part of the state. Goose numbers have been good across most of the state in the weeks leading up to the opener.